I almost threw the card away. Almost everything I buy seems to come with one, and they’re never worth filling out. You’ve seen these countless times. 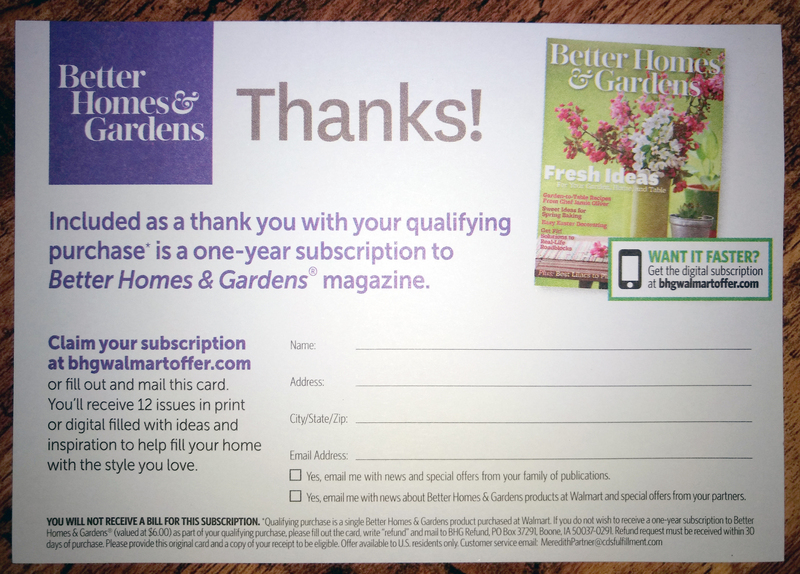 They’re postcards for warranty registration or mailing lists or magazines at 98 percent off the newsstand price. They fall out of books and periodicals and catalogs and pretty much anything that comes in a box. I had already assembled one end table and gathered up all the stray bits of plastic, cardboard and Styrofoam bits that had spread out from the center of the work area like fallout from a nuclear blast. With the entire mess disposed of in the garbage and recycling bins, I turned my attention to the next end table. As I organized all the pieces for assembly and started a fresh pile of trash, something on the card caught my eye. This furniture sold by Wal-Mart was part of a Better Homes & Gardens collection. The card in each of the three boxes we bought was an offer for a free 12-month subscription to BH&G as a thank you for buying the collection. At the bottom of the card was the fine print. Huh. You mean each one of these cards is worth $6?! I rescued the card I had thrown away, filled out all three of them and mailed them in with copies of the receipt. This week, a check arrived in the mail for $18. I can’t say I’ve ever really looked at the fine print on those things before, but I will now. And I bet you will, too.